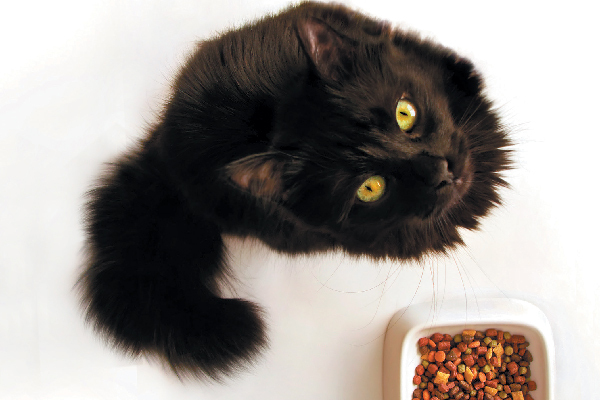 If your cat won't eat, there could be a few different issues at play. Let’s look at what causes anorexia in cats and how to handle feline anorexia. Many dogs deserve the chowhound moniker, while some cats are accurately branded as picky eaters. But if a cat won’t eat altogether, he may be experiencing anorexia or what’s known as pseudo anorexia. Both can be life-threatening, especially if your cat goes without food for a few days. That’s why veterinarians urge you to pay close attention to your cat’s eating habits, especially if your cat won’t eat. Anorexia in cats is not to be confused with the human condition called anorexia nervosa. In cats, the condition is almost always due to an organic, physiologic trigger. What is anorexia in cats? If your cat won’t eat, there might be a few issues at hand. Photography by aleg baranau / Shutterstock. A poor appetite, refusal or inability to eat definitely merits a visit to your veterinarian pronto, as affected cats can develop a severe liver condition called hepatic lipidosis. In essence, fat infiltrates the liver and can cause total liver failure and death. Treatment for cats with feline anorexia or pseudo anorexia varies. The specific treatment is based on the underlying diagnosis as well as the impact of related symptoms. For example, it is imperative to control or eliminate nausea in a cat. Same goes for providing intravenous fluids for a dehydrated cat. Even a low level of potassium can cause diminished appetite in a cat. If your cat’s appetite remains lackluster after a few days, she might be fitted with an esophagostomy tube. This e-tube is a feeding tube that enters the skin at the side of the neck near the chin and extends down into the esophagus. It is secured in place using sutures and then a protective bandage is placed around the neck. 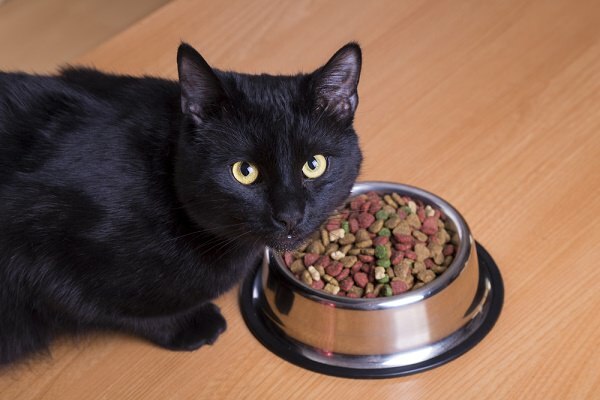 If your cat won’t eat, what could be causing it? Reaction to medication. Some antibiotics, for example, can cause nausea in some cats. Aversion to food when a cat feels sick and attempts are made to try to force-feed the cat. Inability to smell. Remember, the sense of smell influences a cat’s appetite. Thumbnail: Photography ©earth2015 | Thinkstock. Tell us: Have you ever had a cat who wouldn’t eat? How did you solve the issue? This piece was originally published on March 1, 2018. How to Feed Cats: Are We Doing It Wrong? Just four days ago my cat completely stopped eating and drinking. She also threw up multiple times. The best she has done is barely sort of try to eat a teeny bit of canned tuna, but it was like she couldn’t get it in her mouth and she quickly ran away. She also rolled around on cat nip and inhaled/ate a little bit of it. But then threw up 7-8 hours later. I brought her to the regular vet twice and they found nothing wrong with her on exam, Xrays or a blood and urine test. Last night she threw up again and is clearly not herself. I brought her to an animal hospital and they redid bloodwork and did a sonogram and rechecked her mouth and body and still came up with nothing. The only thing that the doctor said seems odd for a de-hydrated cat is that her urine is watery, which is a kidney issue indicator – but nothing on the blood test, xrays nor sonogram reveal kidney problems. She is staying overnight there so they can give her fluids, meds, and monitor her. While it seems good they haven’t found anything “wrong,” it is very scary and frustrating that she is clearly not well! p.s. she isn’t even 4 years old yet! I am at a panicked loss. My kitty is 14 and is diabetic with early Kidney disease. She has decided she no longer likes Pate. Would rather bury it than eat it no matter what the brand. The only thing she will touch right now is Whiskas cuts in Gravy but she basically just eats the broth and few morsels. She is also on a bit of Purina D/M dry. Any suggestions on what to feed her to get her eating more protein? So many types minced, cubed, flaked and on it goes. thought about giving her some of the Pure bite food toppers along with a better quality broth/gravy type canned food. We suggest contacting your vet to get a professional opinion on what is best for your cat as well. my cat has not been eating reguler he only eats little this has been going on for two weeks and the other day he went into a siezer. he is 13 years old what can i do to help my cat i cant afford to take him to a vet. Please help. My two 10-yo kitties are healthy, eat Iams dry food very well and drink lots of water, as evidenced by a wet wet litter box. I started as a treat sharing a can of canned food occasionally, but now they cry and won’t eat the dry food. I tried adding the wet food on top of the dry, then they just gobbled so fast and threw it up unchewed. So I tried separate bowls which didn’t work. Now I’m feeding them 2 cans daily because they whine constantly when I enter the kitchen, and they never touch the dry food anymore. Any ideas? I’d rather Keep the mix of dry/wet. If I have to change… What are the quality wet options? If your kittens continue to refuse food, we suggest contacting your vet for advice and make sure there is no underlying problem. My cat is refusing the Iams dry food too. I noticed that since they changed the shape she will not touch it at all. It was star shape and now is pebble. Maybe they changed the formula as well. My 10-year-old cat often has dry, hard movement. I’ve increased his canned food, and he always has fresh water available, and my vet has not been concerned. When the cat stopped eating and started hiding under the sofa, I made an appointment. The day of the appointment, the cat “laid an egg” (had an extra-large, hard movement)! I took him to the vet, anyway, along with the stool. The vet suggested I give the cat very small quantities of a human stool softener. I tried giving him 1/4 tsp. Miralax once a day, and the problem cleared up. Now I only give it to him every other day. My 2 cats 8, 9 very good eaters, seemed to suddenly be barely eating or drinking much water. They eat wet food primarily, I tried different canned food & treats, with a lot coaxing & babying, slowly improved. That was last week totally back to normal. It came on suddenly & they recovered quickly. all those weeks your cancer grew? You could have been saved. Human dentists are trained to look for symptoms of cancer – I wonder whether vets who perform dentistry on pets are, too? So sorry for all your pain, Sara. I’ve had a multitude of pets, currently have adopted 6 strays that were abandoned. I have a very low opinion of vets because the majority are incompetent while gouging owners with inflated bills with guesswork prescriptions. I had one severe malpractice case presented to the state board of medical examiners who consistently side with their colleagues. The young cat that I had adopted was shot with a pellet gun in my neighborhood. ER vet prescribed antibiotics for a pellet infection created by fur being pulled into the abdomen by the pellet, which she said cleared all internal structures. Not true as a subsequent vet told me. The spleen/abdomen was loaded with pus and I had to have her put down. Bill for this came to over $2300. I’ve had another incident with another adopted cat that ran about $1500 that I’m currently paying off with CareCredit. I have miniscule trust in vets. Their training is lacking. And they rarely acknowledge they may have made an error. To picture a cat in front of a bowl of dry kibble is disturbing. Dry food is a cat parent’s easy way out. Keeping dry food in a container or bag for days destroys any nutrients that dry food might have. Add that cats, as a rule, drink very little water and dry food does nothing to fight potential dehydration. Wet food contains necessary moisture. Feral or wild cats get hydrated from their prey or variable drinking sources together. Dehydration kills. Urinary tract infections, kidney stones, feline idiopathic cystitis, and lower urinary tract disease can all be a result of chronic dehydration in your cat. Add that as carnivores, canned cat food in general contains more meat than kibble diets and cats are obligate carnivores, requiring few, if any, carbohydrates. I’m not saying that canned food is the end all. Mixing dry as a treat is a good option. Leaving around bags of dry food or bowls of dry food is a sure way to lack of necessary nutrients necessary for your cat’s health. I’m sure some will disagree, but it is truth no matter how commercial pet food companies lie to their customers. Also, you can’t see what matter is in dry food making it easy to use anything in its ingredients and commercial pet food companies are not without greed and the need to pump sales. Gosh Madeline! Thanks for shaming cat owners. Maybe you’ll be the reason fewer are adopted! When I moved I noticed my male cat suddenly stopped eating. His sister ate her food, so I knew it wasn’t bad food. I tried several things (he was living on freeze dried treats and his sister was helping herself to his food) and did some research, got both of them vet checked. The vet said it was probably stress from the move. Finally after two weeks I discovered his problem. All I had to do was move his bowl. He didn’t feel comfortable eating in a high traffic area in the kitchen, even if no one was in there. At our old place his bowl was very private and high up, on top of my desk shelves. His sister’s new eating area is in a quieter place so she adjusted quickly. Once I moved his bowl to a quiet corner in the dining room he started eating just like before. I had a cat who loved to eat.I noticed she went under the bed and was not coming out.She was black so when I shined a flashlight under the bed I could clearly see her skin was yellow.Diagnosed with fatty liver.I was told of the tube in the neck thing as well as weeks in the hospital which I could not afford.If food would cure her I told the vet I would make it happen.I bought prescription canned food,added a touch of water,drew it into a large people type syringe and would shoot it in her mouth several times a day.I did this for a number of weeks.She recovered and lived on.The vet said she didn’t think it would work and she had never heard of home treatment.It was my only choice for her survival.So happy it worked. Better than a people syringe is a ‘small animal feeding syringe’ – these are readily available at any feed store/pet supply store. Amazing! I am so glad that your cat lived. Veterinary care is so important, but extremely expensive. Often, love and care does much. I am going through the same thing now, so thank you so much for sharing. My almost 18 yr old kitty stopped eating and drinking and is hiding in the closet. Been to the vet who prescribed something for her tummy (previously throwing up and diarrhea). I am trying to prepare myself for the worse, and at the same time, trying to think of everything I can do to help her. I bought a syringe today, and will start feeding her. Thanks again. How long did it take for your cat to start eating again? My cat has had lip hepdosis for a while but I continue feeding her through a syringe. Threee weeks now with the syringe. The vet is recommending a feeding tube but she’s not lethargic she is walking around and sometimes plays so I didn’t see that as an option right now. What should I do? The medication, methimazole, used to treat hyperthyroidism in cats, if given in too high of a dose, can cause severe nausea and loss of appetite, depressing the entire system and compromise kidney function. Be very careful if you ever have to give this medication to your cat. Most vets prescribe way too high of a dose. I learned too late and my cat died from the overdose. This medication should never be administered at a dose higher than 1.25 mg twice a day as the beginning dose, until you see how your cat reacts to it. Janet, that’s why my Vet starts out with blood work, and 1.25 mg 2x day, 2 weeks later more blood work then adjust the dose. My kitty’s dose settled at 2.5 mg 2xday. Now after 4 mos., blood work every 2 weeks have shown his thyroid is normal, bun/crea normal. Now I’m opting for radioactive iodine therapy, because he’s got 4-5 more years to live. Most of my cats live to at least 20. Blood work is key to monitor thyroid levels and Bun/Crea levels.